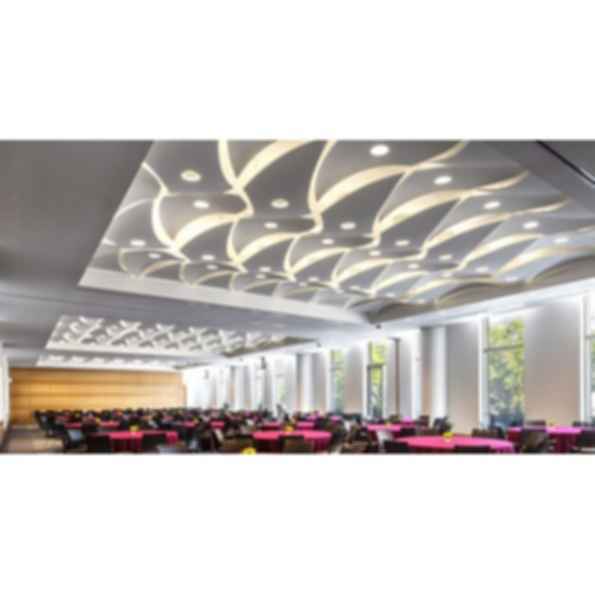 Decoustics' Nuvola acoustical shaped panels are constructed from a fiberglass core and are finished on all sides with Decoustics' Claro finish, which can be color-matched to a wide range of paint chips. When Nuvola panels are suspended at various heights and angles, a uniform appearance is presented regardless of the viewing point. Nuvola acoustical clouds and shapes can be installed (reveal mount only) individually to identify a space or grouped together to create unique configurations. Nuvola is available in 11 standard sizes which include pre-curved and flat shapes. Decoustics can also manufacturer unique flat, pre-curved, and shaped acoustical panels to meet project specific designs and requirements. Decoustics' Nuvola integrates the panel suspension by incorporating an innovative, spiral spring anchor hanger. This simple component allows the installer to efficiently install anchor points on the panel back. Utilizing a locator template, the spiral spring anchor hanger is installed by simply twisting clockwise into the panel body. This is a quick and efficient method of installing hanging points without the use of installation tools.